Elements found in the natural world are sometimes those that create a most unique setting or focal point in the landscape. Trends even point toward man-made items using recycled materials which create a finished piece that imitates nature herself. Most common in textile design, it’s spreading to all sorts of products these days. Of these two unique bird baths, one is wood, and one is handcrafted using 60% recycled materials. Can you tell which is which? Actually, it’s pretty amazing stuff! The first bath is teak, and you may think: Teak? Yes, because of the durable properties, and denseness of the wood, it makes for a really cool bird bath (no pun intended). Birds bathe naturally at ground level, and this beauty, complete with non-toxic sealant, provides an excellent water source to entice feathered friends. It’s simply gorgeous in the landscape, and durable just like that high-end teak furniture we all dream of having! Now this is the bird bath that’s hand made using mostly recycled materials, but you’d absolutely swear it was cut from a huge old tree! 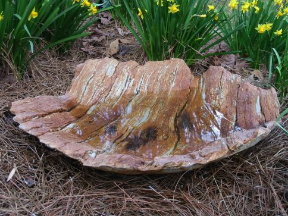 The shape, texture, and color all say this is a piece of tree… but it’s not! Any ground bath may be placed on a deck for great close up views of your birds. An old tree stump is ideal for placing one too. A plant stand, or even an interesting planter all make perfect choices for supporting a ground bath. 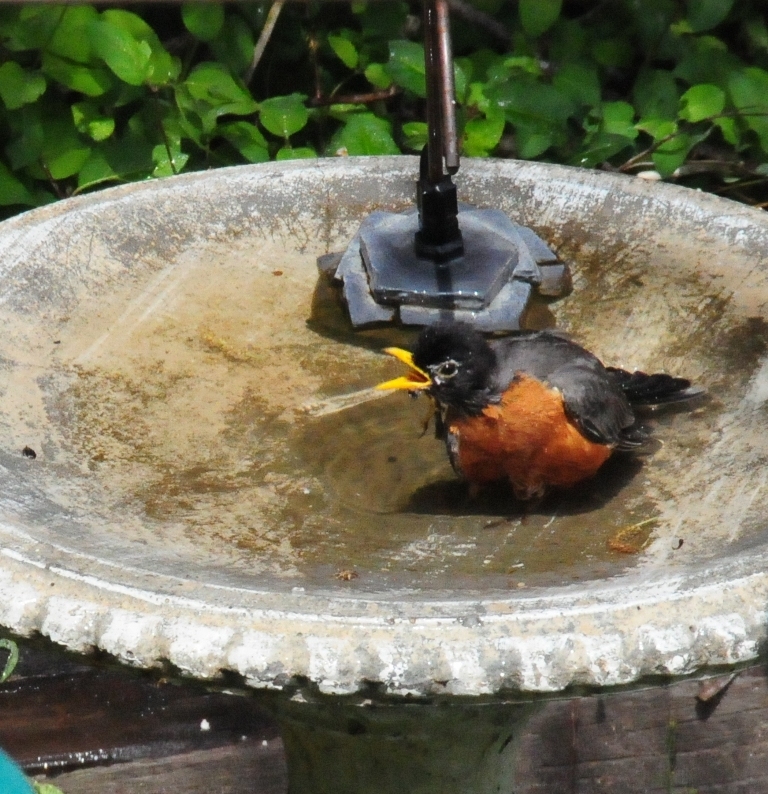 By the way, fresh water really is the best way to attract more birds, especially with the terrible heat and drought that’s plagued most of the country this summer. Just keep water fresh… and the birds will come! 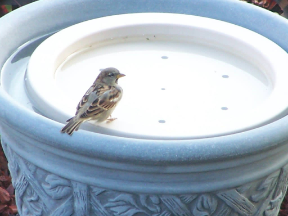 Create a Birdbath in no time flat! Fresh water in a birdbath… no matter what season, it’s the best way to entice birds and even keep them hanging around. It doesn’t have to be an elaborate setup or beautiful piece of art either. Just clean, fresh water at the correct depth will do perfectly. The optimal depth for birds to bathe and wade comfortably is about 2″-3″, but if you have a favorite planter or garden pot, you can turn it into birdbath by adding a raft. The Birdbath Raft serves just that purpose. 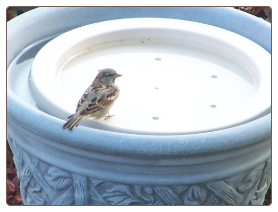 It’s a wonderful and innovative design that allows you to turn any simple container into a useful birdbath. It’s great for making a deeper bowl birdbath shallow and safe, and more comfortable for birds. The BirdBath Raft floats, exposing just the right amount of water for birds. 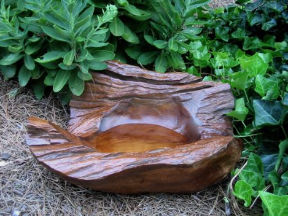 Turn an old wooden barrel into a beautiful water feature, you can be creative and imaginative with the cool product. Durable, simple, UV protected, easy to clean, and made in the USA. 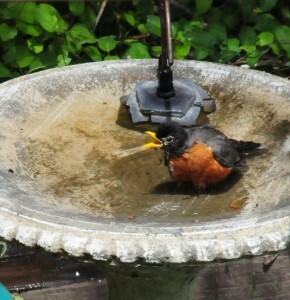 Attract more birds with fresh water in a birdbath!